Any member of the active duty military who fails to report when and where he or she is expected is considered absent without leave (AWOL). Even if you're just a few minutes late to a drill, you could be considered AWOL, and subject to penalty. The Reserves, however, handle AWOL a bit differently than their active duty counterparts. Members of the Army and Air National Guard are not subject to the Uniform Code of Military Justice unless they have been called to federal active duty service. It means that members of the National Guard cannot be punished for missing weekend drills or failing to show up for the two weeks of annual training. Unless called up to federal active duty service, the National Guard belongs to the individual state and not the federal government. However many states have enacted state laws which mirror the UCMJ articles for Guard members performing state service. In all cases, whether Guard or Reserve, members ordered to Extended Active Duty (EAD) -- such as for a deployment to Iraq or Afghanistan -- are subject to the UCMJ. Guard and Reserve members who refuse or fail to comply with EAD orders, or go absent while on EAD are treated the same way as active duty members who go AWOL. What happens if a Guard or Reserve member fails or refuses to show up for weekend drill? The services don't generally court-martial Reservists who fail or refuse to participate in a drill. The rules vary according to each branch of the service. Army Guard and Reserve members who refuse to report to Initial Active Duty Training (IADT) are usually discharged for "entry level performance and conduct." Participation in weekend drills for Soldiers who have not yet gone to Basic Training (boot camp) is completely voluntary. Members who report for IADT and then go AWOL are treated the same as active duty members who go absent. After IADT, Reservists who have accrued in any one-year period a total of nine or more unexcused absences from scheduled drill, or who miss Annual Training (AT) are considered "unsatisfactory participants." What happens then is up to the unit commander. If the unit commander thinks the member still has to potential to be deployed, the commander can transfer the member to the Individual Ready Reserve (IRR). The commander can also impose a grade reduction in conjunction with the transfer. However, if the commander believes the member does not have the potential to participate in deployments, discharge action will be initiated. Most such discharges are characterized as other-than-honorable conditions (OTHC). And since the Army National Guard belongs to the state, not the federal government, individual state laws may apply. Air Force Reservists who have been in the service for less than 180 days are considered to be in "Entry Level" status. Entry Level airmen who refuse to participate in a weekend drill or refuse orders to IADT are almost always discharged. Most such discharges are characterized as entry level. However, Reservists who go AWOL during IADT are processed the same as active duty members. Reservists who have nine or more unexcused absences from a weekend drill in a one year period, or who fail or refuse to complete the two-week annual training are considered "unsatisfactory participants." Under these circumstances, the commander has several options. He or she can delay or defer promotion or impose an administrative demotion, or can involuntarily call the member to active duty for a period not to exceed 45 days. 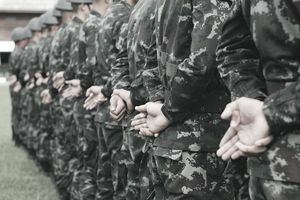 If the member has not completed their Military Service Obligation (MSO), the commander can even involuntarily recall the member to active duty for a period not to exceed a total of 24 months. Failure or refusal to comply with such orders to involuntary active duty constitutes absence without leave AWOL, and the member is treated just as active duty members are. The commander may also transfer the member to the IRR. Finally, if the commander determines that continued Reserve service is not in the best interest of the Air Force, he or she may initiate discharge action. Most such discharges are characterized as OTHC. Members of the Navy Reserve, who have not yet started IADT and who refuse to participate in drill or IADT orders are discharged as an uncharacterized Entry Level Separation (ELS). Members who go AWOL while in IADT are treated the same as active duty personnel who go AWOL. If the commanding officer believes the circumstances that caused the Reservist to be an unsatisfactory participant have been resolved, he/she can place the member on six months probation. Otherwise, the commander can recommend transfer to the IRR. Finally, the commander can initiate discharge proceedings for the reason of "unsatisfactory participation." According to MILPERSMAN 1910-304, such discharges are usually characterized as Honorable or General (Under Honorable Conditions). A Marine Corps Reserve member who has not yet attended IADT, who refuses to ship out to Basic, or who state a desire to be discharged, are administratively discharged as an uncharacterized Entry Level Separation (ELS). Members who go AWOL while in IADT are treated the same as active duty personnel who go AWOL. When a Reservist acquires at least nine unexcused absences or is categorized as an unsatisfactory participant for reasons other than excessive absences, the unit commander may either retain the Reservist and authorize him/her to regain satisfactory participation status; or initiate separation proceedings. Coast Guard Reservists are obligated to complete IADT, report per orders, and attend 90 percent of scheduled, authorized paid weekend drills per fiscal year; and, must satisfy the annual training (AT) requirement. Unsatisfactory participation is the failure to comply with any of the obligations listed above. Participation is also considered unsatisfactory when members of the SELRES acquire at least nine unexcused absences from scheduled training within a 12-month period. What happens to Reservists who are "unsatisfactory participants" is up to the commanding officer. Reservists who have not fulfilled their statutory military service obligation (MSO) may be ordered involuntarily to active duty if they have not accumulated more than 24 months of combined active service. The CO may also elect to transfer members to the IRR. Finally, the commander may elect administrative discharge. As with other branches' Reserves, anyone failing to comply with any involuntary order to active duty is reported as AWOL and handled just like active duty AWOLs.